Germans flew 'Gothas,' their first strategic bombers, over England in World War I. Although no other bomber, German or Allied, cradled more than two 112-pound bombs, the Gotha was capable of carrying more than 10 times that amount and dropping them with remarkable accuracy by using a high-tech Goerz bombsight. Twin engines gave these bombers a top speed of 88 miles per hour and a ceiling of 16,000 feet, well above the reach of most defensive fighters then based in England. Because the Gothas flew so high, tanks of liquid oxygen were available if needed by crewmembers. 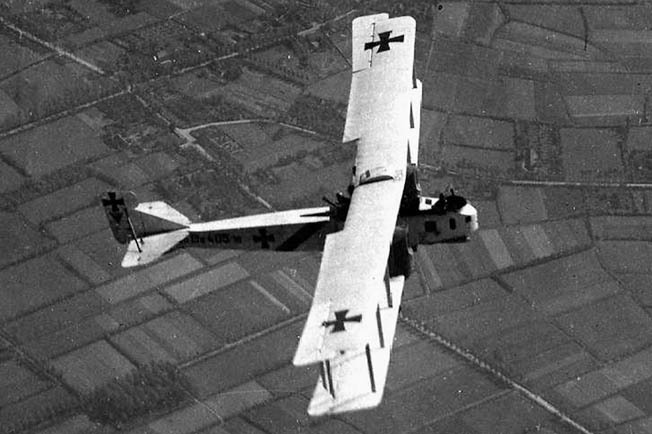 The aircraft’s many unique features convinced German leaders that the Gotha was a plane capable of winning the war. One Gotha experienced engine problems halfway to the coast and landed near Thielt. Another suffered fuel line problems over the North Sea and began falling behind. Unfortunately, Brandenburg had no radio (because of its prohibitive weight) to find out what was wrong with this Gotha, which was painted with undulating serpents from nose to tail. Finally, the pilot of the troubled plane fired several red flares to indicate he was turning back and dumped his bombs into the sea. Meanwhile, an observer on board scribbled a message about the bomber’s problems to be carried back to a German coastal station by one of two pigeons aboard. 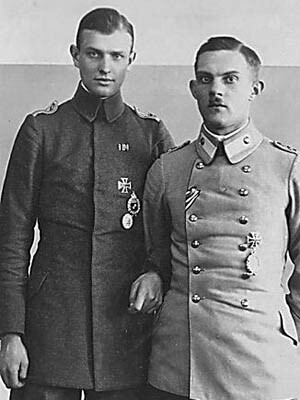 Brandenburg had marched off to war in 1914 as an infantry officer, but after being severely wounded ended up an air observer flying over the front. From observer he had moved up to command the important Englandflieger, or England Squadrons, which he was now leading up the Thames Valley without opposition. Thick, towering clouds greeted the planes over the capital instead of the clear weather forecast in Belgium. Accurate bombing would be impossible, so the pilots reluctantly turned southeast and headed off to find another target. They dropped a scattering of bombs along the way over Kent. These were aimed at Lympne Airfield and destroyed a few British airplanes about to take off. The Gothas then went in search of Folkestone, a major supply port for British armies in France. The sky was clear at this seaside resort filled with unsuspecting crowds in a holiday mood for a Whitsun celebration. The Gothas droned high overhead. Although the raid lasted only 10 minutes, 60 bombs found their way to unsuspecting throngs in the Tortine Street shopping district. “The whole street seemed to explode, with smoke and flames everywhere,” one eyewitness reported. “Worst of all were the screams of the wounded.” The death toll was 95 along with 260 wounded, far higher than from any German Zeppelin airship raid. The Gothas droned out over the North Sea again for the return flight to Belgium, ending their raid. The Germans had just introduced a new degree of aerial warfare, changing how wars from the sky would be fought during World War I and in future wars. German efforts to create strategic bombing from the air with specially designed monster planes sprang from the hope of escaping the war’s hideous and interminable slaughter of ground troops. The bombers appealed to the German emperor and his High Command because they believed civilians had been softened by the Industrial Age and saw a chance to strike at the working class, considered Britain’s soft underbelly. Brandenburg was personally selected to head Kagohl 3, the elite of the Kaiser’s bombing squadrons for the raids on England, by General Ernst von Hoeppner. Kagohl 3 was attached to the German Fourth Army in Flanders, but operated independently of fighting on that front. Its orders came directly from the German Army High Command (OHL). A striking commander with dark, intelligent eyes, Brandenburg emphasized training his crews to handle the unwieldy bombers and to fly together like geese. In the middle of May when the Gothas were ready for their first raid on London, the revered Field Marshal Paul von Hindenburg was driven to a Flanders airfield in a large open car to give Kagohl 3 airmen a fitting sendoff. The lined-up planes were snow-white except for bold black crosses on their tails and fuselages and customized body painting to suit a crew’s own taste. The Germans began air attacks in late 1914 by using their unique Zeppelins. While drawing considerable publicity, these airships caused only minor damage. When the OHL lost faith in the Zeppelins, it ordered increased Gotha bomber production. These planes were produced by the Gothaer Waggonfabrik AG Company, a prewar maker of railway carriages. The German High Command wanted 30 Gothas ready by late May. Dubbed “the Kaiser’s secret weapon,” Gothas were a big improvement over early aerial combat efforts in small, rickety planes. Early emphasis had been on “dogfights” between opposing pilots, then some airmen began tossing small bombs from their open cockpits. Soon French pilots were dropping pencil-sized steel darts called flechettes on unsuspecting ground troops 1,500 feet below. Some were said to have fatally wounded a German general riding on horseback. Bombing efforts gradually became more sophisticated until larger bombers like the Gothas were specially designed to pack a bigger wallop. Gothas were only 41 feet long, far shorter than their extensive wingspans. Two early Gotha models had 72-foot wingspans, with wings on more widely used G.IV models extending 77 feet. The bombers ranged from the G.I model with two 160-horsepower Benz motors, to the improved G.IVs equipped with more powerful 260-horsepower Mercedes motors. The fuselage and wings were made of plywood and fabric. In the front sat the navigator/bombardier, who was also the front gunner. Behind were the pilots. The tail had two guns reachable by a tunnel running through the rear fuselage. One was called the “sting in the tail” because it shot downward to cover the tail’s blind spot. The other rear gun was able to shoot above the plane if an attacker approached from that direction. The machine guns were fitted with electrical dynamo-driven heating so they could be fired in the cold air of high altitudes. Because of chilling temperatures, the airmen dressed as warmly as possible. In addition, oxygen was taken along, but it wasn’t always used. “We rather preferred to restore our body warmth and energy with an occasional gulp of cognac,” claimed one pilot. Brandenburg had to wait weeks for another try on London, but when good weather was predicted, he pounced. Brandenburg and 14 Gothas took off from Ghent at 10 am on June 13, hoping to return before forecast thunderstorms at 3 pm. By midday the Gothas were droning up the Thames. The distant rumble was heard first by English suburb dwellers, who stepped outside to watch the planes—their wonder greater than their fear. They stared in awe at the distinctive formation three miles up. Because of their great height, a British volley from ground guns proved fruitless. At 11:35 am, the Gothas dropped some bombs on London’s East End, with a cluster falling between the Royal Albert Docks and the borough of East Ham. Eight men were killed at the docks and bombs damaged some sheds, offices, and railway cars. Brandenburg, in the lead plane, fired a white flare signaling the Gothas to unleash their main bomb loads, Liverpool Street Station being the prime target. With terrible explosions, 72 bombs landed within a mile of the terminal—only three hit the station itself. Some victims were trapped in a wrecked dining car and two coaches were set afire. Six Gothas then flew across the Thames near Tower Bridge to bomb the Southwark district railway station. Warehouses along the river suffered other blasts. Nearby, a Tottenham Court Road factory was burned out, and 34 casualties resulted when a bomb blasted a Royal Mint mechanic shop. Over the East End borough of Poplar, a bomber dropped a 110-pound bomb on the Upper North Street School; of the nearly 600 students, some 20 were killed and more than 30 injured. The circling Gothas quickly closed up into formation and fled the capital. They faced only a few attacking planes over the suburbs, killing one British observer-gunner, but losing none of their own aircraft. The whole mission took about five hours. That night the Germans at the airbase threw a big party, with Captain Brandenburg proclaimed a hero. In all, his attack killed 132 people and injured 432—more than in any previous airplane or airship raid. While the British admitted this first London raid was spectacular, they insisted it was far from crippling. Nevertheless, it caused a depressive anxiety to grip the capital. Because many workers feared the bombers could return, they stayed away from East End factory jobs. Meanwhile, citizens harangued local politicians over the safety of their homes and families. Prime Minister David Lloyd George and his War Cabinet felt something had to be done to soothe the aroused public and decided to call back two fighter squadrons from the war front, home-based planes not being up to the task. Brandenburg was seriously injured in a plane crash while returning to his airfield from a report to OHL. The Germans named Captain Rudolf Kleine his successor and urged more raids. The new 30-year-old squadron leader with deep, brooding eyes never gained the affection of the crews that Brandenburg had enjoyed, though he commanded their respect. London residents were surprised again on July 7 when 21 Gothas raided a second time. Most bombs fell on private homes, plus a few offices and warehouses in northern and eastern London. The Gothas also sank a Thames barge and damaged a pier. Although only 57 people were killed and 193 injured—less than half the first London raid’s toll—Kleine terrified much of the populace by bombing their rundown houses instead of military targets. The British sent 95 planes aloft on July 7, but most were old and no match for the Gothas. The defense also lacked overall direction and coordination. Prime Minister George felt a new voice was needed to solve this problem and picked Jan Smuts, the well-known South African statesman, to form a committee to study the situation. This eventually led to the creation of an effective air defense system, plus the formation of the Royal Air Force (RAF). Soon improved countermeasures were coordinated by a high command of operations newly located in the Horse Guards Parade building. The British began to learn the preferred routes of the Gothas. To better counter nighttime raiders, English spotters designed a system of warning Londoners by changing the natural gas pressure. When the lights went up and down twice, Londoners had to draw all their window curtains, thus depriving Gotha crews of visual navigation and bombing aids. In addition, Gothas had to contend with more skillfully aimed antiaircraft barrages and fighter planes that knew their routes. At night, powerful searchlights probed the sky. Also helping was the ingenious British invention of barrage balloons. They trailed steel cables designed to cut through the wings of attacking planes if unsuspecting German pilots flew too low. Indeed, here was a “Battle of Britain” and “Blitz” 22 years before the Hitler’s air campaign of 1940. The British eventually learned how to shoot down Gothas, but many more of the German behemoths were lost in landing accidents. The mammoth biplane was notoriously nose-heavy, especially when bomb loads were expended and fuel was low. When these Gothas returned in storms, the landings were described “controlled crashes,” with many of these crack-ups bringing heavy crew casualties. Nevertheless, Gothas had a powerful effect, especially during a week near the end of September 1917. These were the “Harvest Moon Raids,” the pilots sighting by the light of the moon. Residents became so unnerved by the continual bombings that 300,000 or more people a night flocked to the London Underground. It got so bad that entire families started taking to the streets at night with pillows, blankets, and food baskets along with dogs, cats, and caged birds to head for the Underground before an air raid alarm even sounded. With many Londoners’ nerves shaken, Prime Minister George summoned newspaper editors and warned them to tone down their bombing accounts. More was to come. The Germans unleashed on England even bigger bombers, four-engine biplanes nicknamed “Giants,” which had been developed on the Eastern Front. The Riesen or R-type had 150-horsepower Benz engines and a wingspan of nearly 92 feet. OHL ordered Squadron 501 from the Eastern Front to the West and to fly the largest R-39 Giants then being built by the Zeppelin-Werke at Staken, Germany. These were the largest German aircraft produced in any quantity during World War I. They had a 138-foot wing span, just three feet shorter than that of the World War II U.S. B-29 Superfortress. A Giant’s basic crew included an aircraft commander, two pilots, a wireless operator, two flight mechanics, and a fuel attendant. Two gunners could be added as needed. Although essentially a monstrous biplane, the R-39’s fuselage was surprisingly modern. The forward section was built of plywood and completely enclosed. Two pilots sat up front with the throttle controls between them. A Bosch generator produced current for the lighting system and the crew’s electrically heated flying suits. Ground radio stations monitored each Giant’s flight path, making it possible, for the first time, for a bomber to fly blind in stormy weather. Moreover, Giants surpassed Gothas in bomb load capacity. They could carry nearly two tons of explosives, with projectiles sighted and released electrically from the bomber’s nose. Unfortunately for the crew, the planes were even more difficult to land than Gothas, and as it turned out, few Giants were available for raids over England. Englandflieger members got a big surprise in January 1918 when Brandenburg, wearing an artificial leg, appeared on the Ghent airfield. After Kleine’s death, Brandenburg won his old command back, begging not to have to sit out the war as a decorated cripple, but he found a squadron demoralized and thinned from losses. Nevertheless, he would put on a show. OHL wanted a display of air strength as a prelude to the great Spring Offensive of 1918. Instead of going after military targets, the Germans candidly admitted trying to compel the British to maintain a large military zone in England that would hold back resources from the Continent. The nights of the Giants began in late January, when Squadron 501 raided London for the first time without Gotha bombers. One Giant dropped the biggest bomb of the war: A monster by WW I standards, it was 13 feet long and weighed a metric ton. On February 16, 1918, the Giants’ commander, Captain Richard Von Bentivegni, aimed this bomb at Victoria Station. It was way off target and tumbled down more than a half mile away into the Royal Hospital grounds at Chelsea. Blown sky high was a hospital staff officer’s residence in the North Pavilion, killing five family members. Meanwhile, Brandenburg was planning the largest raid of the war for May. He assembled 38 Gothas and two single-engine planes to fly in advance as weather observers and to drop a few bombs on Dover. Although still crushed by his recent plane losses, Bentivegni planned to lead his three remaining Giants. That meant a total of 43 airplanes, 16 more than had ever been sent before against England. They launched the raid on the evening of May 19, Whit-Sunday, a holiday. Bombers flew in the dead of night and dropped 11 tons of explosives. Over a thousand homes and businesses were destroyed or damaged. Forty-nine British were killed and 226 wounded. Casualties reportedly would have been much higher if not for pleasant weather and the holiday, leaving London partially deserted. But the Englandflieger’s biggest raid attempt also was its worst defeat. Ten Gothas were forced back before even reaching the English coast. Seven were shot down and only 16 reached London. One crashed near its airfield on the way home. Brandenburg wanted to launch other London attacks, but his squadron was committed to supporting the German Army. He couldn’t get approval for any more raids on England. On their side of the Channel, the British had learned some lessons. They had fashioned the basics of a defensive system that would hold them in good stead during the renewed German effort of 1940. With radar, it proved unbeatable. Tags Battle of Britain, Boeing B-29 Superfortress, Ernst Brandenburg, German aircraft, Gothas, Imperial Germany, Royal Air Force, Spring Offensive, World War I.